The Mira Costa Choir Department presents its annual Cathedral Concert on March 26, 2019, at 7:30 pm at American Martyrs Church, 624 15th Street, Manhattan Beach. Participating Mira Costa Choirs are Vocal Ensemble and Choral Union. Choir families, friends, and community members are all invited to attend this wonderful celebration of choral music. This concert is an annual fundraiser for the Mira Costa Choirs. Admission $25 For ticket info, click here. Tickets also will be available at the door approximately 1 hour before the concert. Questions? Please contact MCHS Choir Director, Michael Hayden or Choir Booster President, Sene Gray. On Saturday, April 13th, the Mira Costa Choir Dept. 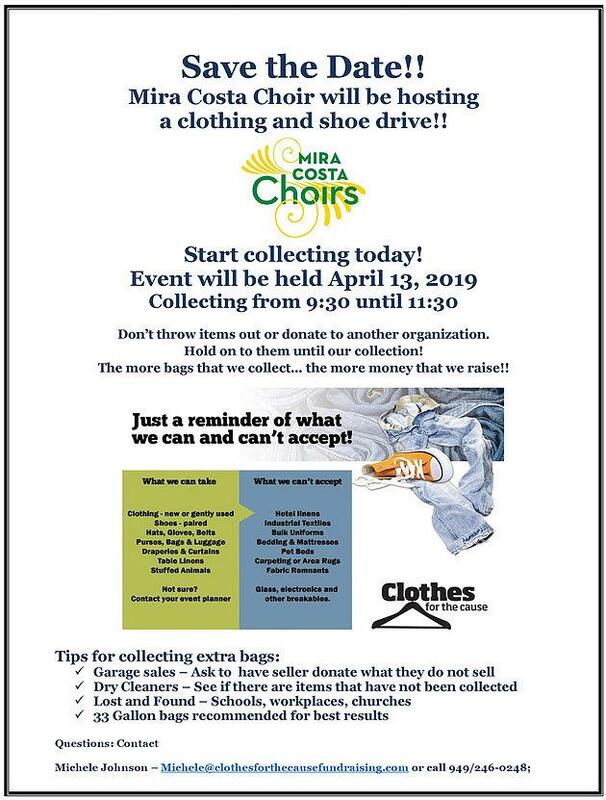 will hold its annual spring collection drive, collecting gently used clothing, shoes, hats, gloves, belts, purses, bags, luggage, drapes, table linens, and stuffed animals (whew!). For a complete list of what we're collecting, please click here. If you’re spring cleaning and have items you'd like to contribute, please drop them off in the school parking lot on April 13th between 9:30-11:30am (we'll have a truck there and volunteers to collect donations). All donations are greatly appreciated! Support Mira Costa Orchestras and start your holiday shopping! Your purchase directly supports the GRAMMY award-winning MCHS Orchestras. To shop, visit www.mchsorchestra.com or contact Janet Wyse. Click here to see the array of colors available. 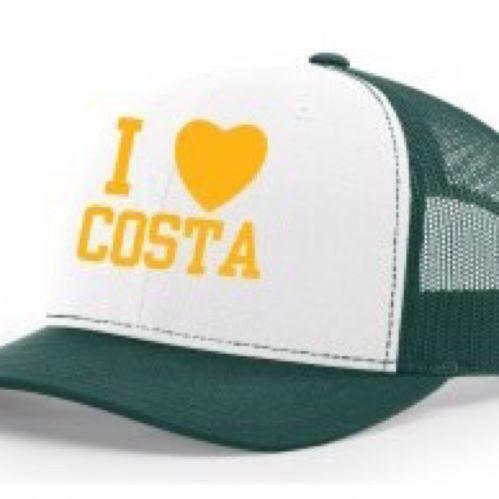 Looking for gift ideas for your up and coming Costa kid? Check out the Boys Lacrosse Store for some fabulous Stadium Blankets, Costa Snuggies and Trucker Hats! They make great Holiday gifts for anyone who cheers on their favorite kid while shivering in the stands or on the sideline. They also keep you warm and comfy during family movie nights, long road trips and gatherings at the beach! 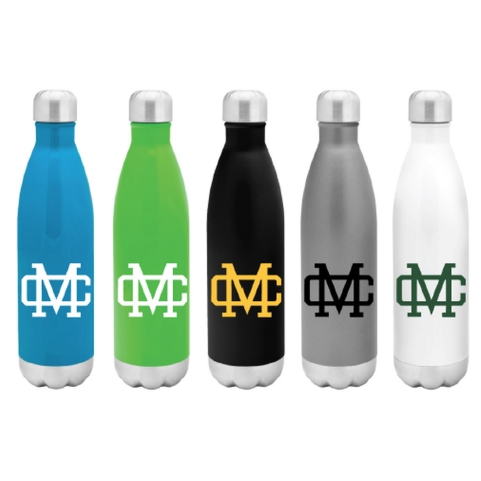 Support Mira Costa in style while helping the Lacrosse team! Go Costa! Friday, January 11 from 4-8:30PM! Your child will have a blast with the national championship MCHS Dance team! Camp will include dance, games and crafts, and the option of performing at a Costa basketball game! Click here for details. Monday, January 21 from 9AM-3PM! 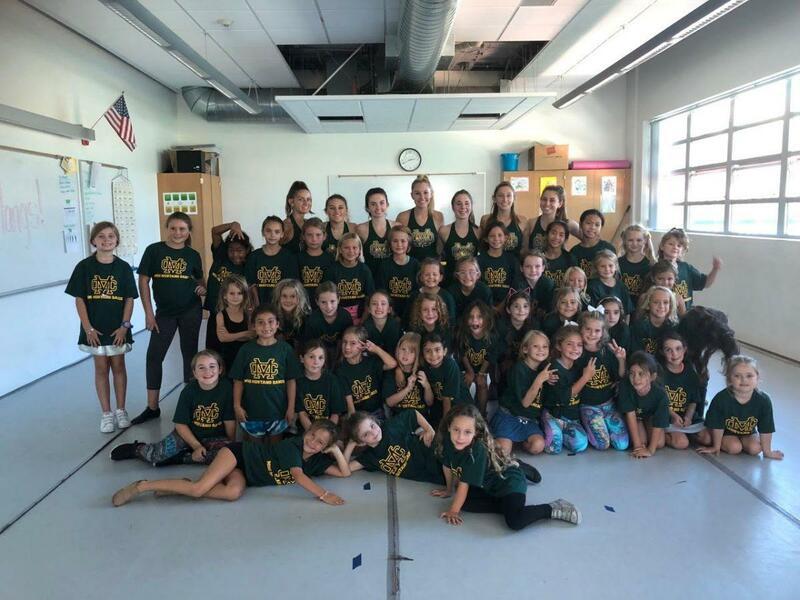 K-8th graders are invited to learn sidelines, cheers, dances and cheerleading fundamentals from the nationally ranked Mira Costa cheerleaders! Click here for details. • MBX - Beyond the Classroom for information about Booster Clubs, Summer School, After School Programs, and Camps. • Team Costa website to view all sports schedules. • Mira Costa Activity Booster Club Fundraiser website to help raise money to support the activities. You can also see the complete list of Booster Clubs where you can directly navigate to their fundraisers. • Interested in learning more about Mira Costa and its surrounding communities from the students perspective? Subscribe to La Vista and receive 10 issues of Costa's student-run newspaper. For more information, please click here. • Keep up with Costa Sports and Extracurriculars with the MBX Newsletter.